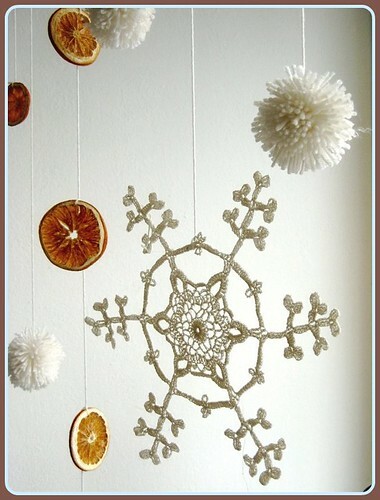 Snowflakes and oranges and pom-poms on branches... Oh wait. Not again, wrong lyrics! But can this idea be any sweeter? We owe Leah thanks for this one, the Bay area blogger behind More Ways to Waste Time sent in a little DIY tip because she noticed recently that I'm a big fan of using vintage doilies in new and exciting ways. 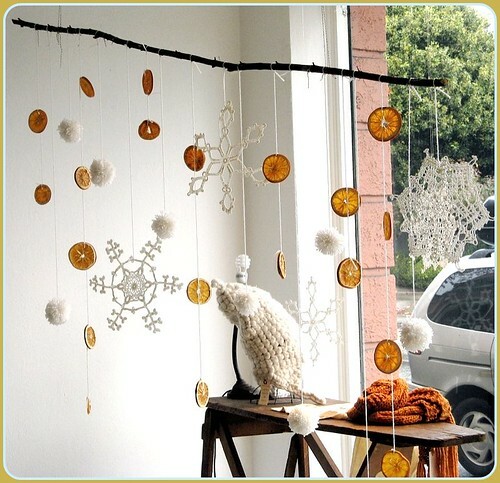 Of course I couldn't resist posting it because this is such an easy way to pretty up your space for the winter season, something you can keep hanging around well into the new year. These photos were snapped recently at the Atomic Garden, a "green boutique" in the Rockridge neighborhood in Oakland, California (Atomic Garden store tour here). This is what you'd see if you walked by their pretty window. Drool. This display would certainly lure me in. Thanks to Jamie and Erin over at Atomic Garden, because they were generous enough to send Leah complete instructions in case you'd like to try this at home. Click here for the complete recipe. :) Just don't eat it, although it's pretty enough to be tempted!